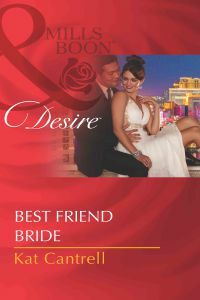 Product description: Best Friend Bride is written by Kat cantrell and published by Mills & boon. Buy Best Friend Bride by Kat cantrell from markmybook.com. An online bokstore for all kind of fiction, non fiction books and novels of English, Hindi & other Indian Languages. Billionaire Jonas Kim only needs one thing to become CEO of his family`s company` a smoothly executed business merger. And to get that, he needs a smoothly executed marriage of convenience. Enter Viviana Dawson, Jonas`s best friend, who agrees to become a contract bride until the deal is sealed. Viv has crushed on Jonas forever but the stubborn tycoon can`t see over the fortress he`s constructed around his heart. Yet when fake marital bliss leads to unparalleled bedroom ecstasy, Viv declares war on the love-shy bachelor-and she won`t settle for anything less than surrender!